Using speech to communicate requires a complex series of actions that begins with selecting appropriate words and organizing them into grammatical sentences. This internally formulated message is then executed as speech through "speech programming," a crucial subconscious process that creates and conveys instructions for movements of about 100 muscles between the lungs and lips. For adult speakers, this results in the production of at least 14 distinct speech sounds per second. When the brain and body systems are intact, this extraordinarily complex speech act occurs effortlessly. Unfortunately, spoken communication can break down in several ways. In aphasia, the ability to select and organize words may be compromised. In what is called dysarthria, language function is preserved, but the speech muscles themselves may be compromised by weakness, spasticity, incoordination, or involuntary movements. When the speech programming stage is affected, the problem is called apraxia of speech. These problems may or may not be isolated and, unfortunately, any one of them can have devastating consequences on the ability to communicate. Speech problems like those described above are often associated with stroke or other traumatic brain injuries. However, they may also be a first and early sign of neurodegenerative disease, a possibility that is often underrecognized by the general public and nonspecialists in medicine. Recently, accumulating research has helped in understanding a neurodegenerative condition that manifests first, or primarily, as apraxia of speech. On average, it takes between 21/2 and three years between initial symptom onset and a diagnosis of primary progressive apraxia of speech (PPAOS). 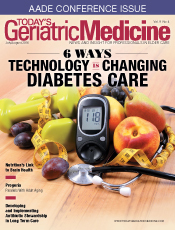 The delay in proper diagnosis can be attributed to a lack of awareness of this condition among both the general public, who, initially at least, may attribute its symptoms to stress or fatigue, and among health care providers, who often misdiagnose this difficulty as aphasia or dysarthria. There is evidence to suggest PPAOS is not as rare as it was once thought, potentially because of misdiagnoses as a functional/psychogenic problem, a variant of aphasia, or another neurodegenerative disease, such as Alzheimer's disease or amyotrophic lateral sclerosis (ALS). What Is PPAOS (and What Is It Not)? Among even expert neurologists and speech-language pathologists, AOS can be difficult to distinguish from other speech and language disorders. This includes its distinction from aphasia. AOS is often overlooked or ignored in patients who receive an aphasia diagnosis, even though one diagnosis does not preclude the other, and they often co-occur. The diagnostic challenge is especially true when aphasia presents as nonfluent or hesitant speech as a result of word-finding deficits or difficulty with grammar. This is in contrast to the delays for speech production seen secondary to restarts and revisions associated with AOS. Furthermore, distorted sound substitutions, secondary to abnormal motor planning, are also often misconstrued as errors associated with aphasia. Some examples of other diagnostic labels that are roughly synonymous with PPAOS include slowly progressive anarthria (or dysarthria), progressive aphemia, phonetic disintegration, buccofacial apraxia, and anterior opercular syndrome. Who Is Affected by PPAOS? Both men and women are affected by PPAOS, with women being more frequently diagnosed. The average age of onset is in the late 60s to early 70s; however, the age range is broad, and onset can be as early as the late 40s or as late as the early 80s. Information gained from careful speech and language examination is the gold standard for the clinical diagnosis of PPAOS. Overall, hallmark characteristics include slow overall speech rate, an increase in distorted sound substitutions with increased utterance length or complexity, segmentation (ie, brief gaps between syllables) within words and between words, and audible or visible articulatory groping of the lips or tongue, suggesting several attempts to produce sounds or syllables, with variable success. Research by the authors suggests that there may be subtypes of PPAOS.5 In what the authors call type 1, speech is dominated by difficulty with articulation (ie, productions of speech sounds), with distorted sound substitutions, and stop and start attempts to correct errors, including audible or visible groping. That pattern of difficulty tends to be more evident when aphasia is also present. In what the authors call type 2, there are predominant prosodic abnormalities, with slowed speaking rate and segmentation between syllable and words; however, there is relatively less difficulty with articulation, as in type 1. The type 2 pattern tends to be more evident in PPAOS. In the Type 3 pattern, there is no clear predominance of the articulatory vs prosodic abnormalities; they are both nearly equally evident. What Is the Prognosis and Treatment for PPAOS? For most people with PPAOS, speech intelligibility (or the ability to be understood) declines over time. The rate of this decline varies from person to person. In somewhat less than one-half of affected individuals, progression to mutism may occur within four years, but the progression of speech decline can be considerably slower in others. In addition to changes in speech, our research and experience with affected patients reveal that other deficits typically emerge during disease progression. One of the most frustrating features of PPAOS is the patient's normal insight into his or her deficits and difficulties. While there are currently no curative or stabilizing options for this neurodegenerative process, there are several options available to compensate for the loss of speech. When language and thought processes are preserved (ie, there is no aphasia), handwriting and other electronic applications, some with synthesized speech, permit continued effective communication. In some cases, speech therapy may improve or help to maintain speech intelligibility for a period of time. Once the diagnosis is made, and sometimes before, it is recommended that patients seek treatment with a speech-language pathologist who can make recommendations regarding speech therapy and appropriate augmentative and alternative communication devices. — Rene Utianski, PhD, is a clinical postdoctoral fellow in speech-language pathology at Mayo Clinic in Rochester, Minnesota, and an assistant professor of neurology at the Mayo Clinic College of Medicine. — Joseph Duffy, PhD, is an emeritus consultant of speech pathology in the department of neurology at Mayo Clinic in Rochester, Minnesota, and professor of speech pathology at the Mayo Clinic College of Medicine. — Keith Josephs, MD, is a consultant of neurology at Mayo Clinic in Rochester, Minnesota, and professor of neurology at the Mayo Clinic College of Medicine. He is the principal investigator of many National Institutes of Health-funded grants including a grant to study primary progressive aphasia and primary progressive apraxia of speech. 1. Mesulam MM. Primary progressive aphasia — a language-based dementia. N Engl J Med. 2003;349(16):1535-1542. 2. Gorno-Tempini ML, Hillis AE, Weintraub S, et al. Classification of primary progressive aphasia and its variants. Neurology. 2011;76(11):1006-1014. 3. Josephs KA, Duffy JR, Strand EA, et al. Characterizing a neurodegenerative syndrome: primary progressive apraxia of speech. Brain. 2012;135(Pt 5):1522-1536. 4. Duffy JR. Apraxia of speech in degenerative neurologic disease. Aphasiology. 2006;20(6):511-527. 5. Josephs KA, Duffy JR, Strand EA, et al. Syndromes dominated by apraxia of speech show distinct characteristics from agrammatic PPA. Neurology. 2013;81(4):337-345. 6. Josephs KA, Duffy JR, Fossett TR, et al. 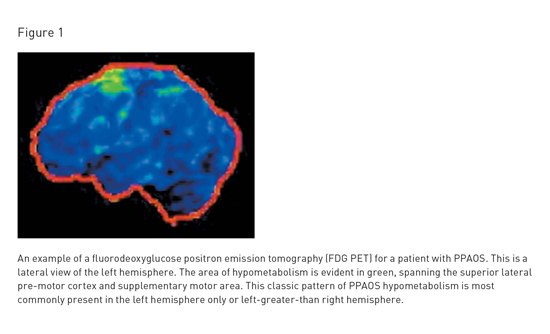 Fluorodeoxyglucose F18 positron emission tomography in progressive apraxia of speech and primary progressive aphasia variants. Arch Neurol. 2010;67(5):596-605. 7. Josephs KA, Duffy JR, Strand EA, et al. Clinicopathological and imaging correlates of progressive aphasia and apraxia of speech. Brain. 2006;129( Pt 6):1385-1398. 8. Deramecourt V, Lebert F, Debachy B, et al. Prediction of pathology in primary progressive language and speech disorders. Neurology. 2010;74(1):42-49. 9. Josephs KA, Duffy JR. Apraxia of speech and nonfluent aphasia: a new clinical marker for corticobasal degeneration and progressive supranuclear palsy. Curr Opin Neurol. 2008;21(6):688-692. 10. Josephs KA, Boeve BF, Duffy JR, et al. Atypical progressive supranuclear palsy underlying progressive apraxia of speech and nonfluent aphasia. Neurocase. 2005;11(4):283-296. 11. Duffy JR, Peach RK, Strand EA. Progressive apraxia of speech as a sign of motor neuron disease. Am J Speech Lang Pathol. 2007;16(3):198-208.